Omega Q Plus Resveratrol builds on the tremendous heart health foundation of original Omega Q Plus by adding the incredible anti-aging power of resveratrol. This astonishing supernutrient works to reduce inflammation, support your memory and brain power, and preserve your youthful appearance and vitality...no matter what your age! Now with TWICE the CoQ10 for the cardio energy benefits you love Although most people start taking an Omega Q Plus supplement for its robust cardiovascular benefits, including support for healthy blood pressure, blood vessels, cholesterol ratios, and triglyceride levels, it's the revitalizing energy boost that they can really feel. That energy is fueled by the world's most potent form of CoQ10. It's called Hydro Q-Sorb and clinical trials have shown it is 3 times better absorbed than ordinary CoQ10 powder! That means this special form of CoQ10 can more readily reach your bloodstream so that the mitochondria "engines" inside your cells keep your physical and mental energy levels soaring! And now, advances in manufacturing have made it possible for us to double the Hydro Q-Sorb CoQ10 you get in every dose! NEW Omega Q Plus 100 Resveratrol gives you 100 mg of Hydro Q-Sorb CoQ10, twice as much energizing heart nutrition, in the same, easy-to-take 2 softgels! Plus ALL of the heart-smart nutrients you love in Omega Q Plus Resveratrol You'll also get a full daily dose of my favorite omega-3 oil, Calamarine, which delivers FAR MORE heart-healthy DHA than most ordinary fish oil, with no fishy aftertaste! In addition, the formula includes L-carnitine and a robust array of B-vitamins for added energy, toxin removal, and more. SUPPORT FOR HEALTHY BLOOD PRESSURE, CIRCULATION, BLOOD VESSEL HEALTH, AND ANTIOXIDANT PROTECTION WITH EXCLUSIVE COMBINATION OF INGREDIENTS FOUND IN OMEGA Q PLUS RESVERATROL. Developed by integrative cardiologist Dr. Stephen Sinatra to bring together a healthy foundation of heart-smart nutrients like 100 mg of Hydro Q-Sorb CoQ10 plus the incredible antioxidant power of resveratrol for outstanding heart health, energy, and circulation support. PROTECTS YOUR HEART WITH 100 MG OF HIGHLY ABSORBABLE COQ10. Cardiologists often call CoQ10 the "miracle nutrient" because it fuels your cellular power plants. This is important for your heart muscle as it requires huge amounts of oxygen and energy to function. Omega Q Plus Resveratrol features 100 mg of Hydro Q-Sorb CoQ10, a bioavailable form of CoQ10 up to 8 times better absorbed to provide antioxidant protection against free radicals that can damage your heart health and overall well-being. SERIOUS NUTRITIONAL SUPPORT FOR THOSE WHO WANT EXTRA SUPPORT FOR THEIR HEART, ARE OVER AGE 60, OR TAKING A STATIN. If you fall into any of these categories, you may need more CoQ10! This formula provides a full 100mg of CoQ10 in a single dose to help give your heart the support it needs. 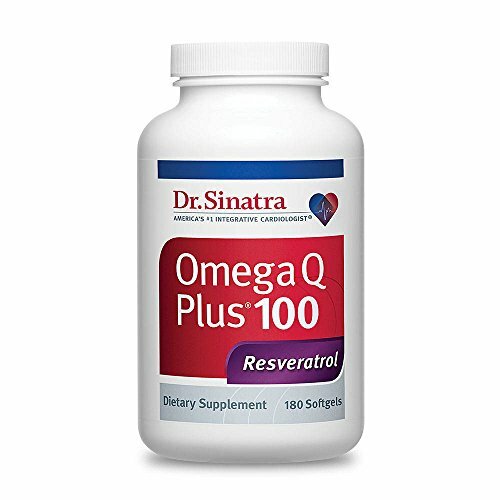 And, it's the same CoQ10 that's been used in Dr. Sinatra's Omega Q Plus Resveratrol formula (with 50 mg of CoQ10), which has been clinically shown to raise CoQ10 blood levels by 55%! And by 60% in statin users! COMPREHENSIVE HEART HEALTH SUPPORT IN ONE DAILY DOSE. Just two little red pills provides protection for your heart, plus support for circulation and arterial health; healthy blood pressure levels;protection against oxidized LDL, support for healthy triglyceride and homocysteine levels; protects your heart, brain and eyes, and support cellular energy production. A FULL DAILY DOSE OF OMEGA-3S WITH PURE, CLEAN CALAMARINE AND NO FISHY BURPS! Supplementing with omega-3s is one of the BEST things you can do for your heart, brain, eye, and whole body health. Calamarine oil is a pure, clean, odorless omega-3 oil derived from deep-water calamari (squid), not fish. Calamari are naturally richer in DHA than ordinary fish oil making it a great choice to support your heart, brain, eye and whole body health. If you have any questions about this product by Dr. Sinatra, contact us by completing and submitting the form below. If you are looking for a specif part number, please include it with your message.